I just wanted to share a quick and easy card with you today. 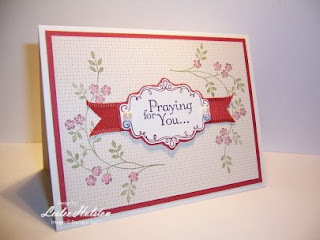 This card is one of several cards to be featured at my Stash Card Stamp-A-Stack class held on April 18th. The theme will be Get Well and Sympathy cards. I never seem to have one in my stash and, let's face it, they really aren't all that joyful to make either. So, I thought it would be loads of fun to stamp a bunch with all my friends! Sound like fun? Join me! This card uses a direct-to-stamp marker technique. Another really quick and easy way to add additional color to your image. The frame around the sentiment was markered and I used my Stamp-a-ma-jig to get perfect placement of my sentiment. I love using tools that make creating cards so much easier. Les' More Tip: Note the simple use of the ribbon placed behind the sentiment? I used some of my ribbon scraps for it. Less can be more...perfect!